Smith Island is an island on the Chesapeake Bay, on the border of Maryland and Virginia territorial waters in the United States. On its Maryland side, Smith Island is a census-designated place (CDP) in Somerset County, Maryland, United States. It is included in the Salisbury, Maryland-Delaware Metropolitan Statistical Area. Smith Island lies approximately 10 miles west of Crisfield, Md across the Tangier Sound portion of the Chesapeake Bay. The island consists of three communities, Ewell, Tylerton and Rhodes Point, which all sit on the Maryland portion of the island. The Virginia portion is currently uninhabited, although once contained many homes of early settlers. The island has been shrinking in size for centuries, because of a combination of its low elevation and storm erosion. In the last 150 years, Smith Island has lost over 3,300 acres (13 km2) of wetlands because of erosion and post-glacial subsidence into the Chesapeake Bay. 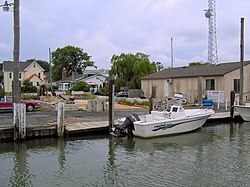 The community is located in a small town-area in the central part of the island, spread across the three inhabited locations of Ewell, Rhodes Point and Tylerton, all located in the state of Maryland. The northern part of Smith Island also includes the Martin National Wildlife Refuge. The southernmost portion of the island consisting of marsh lies in Accomack County, Virginia. There were 167 households out of which 19.2% had children under the age of 18 living with them, 60.5% were married couples living together, 4.2% had a female householder with no husband present, and 32.9% were non-families. 29.3% of all households were made up of individuals and 16.8% had someone living alone who was 65 years of age or older. The average household size was 2.18 and the average family size was 2.69. In the CDP, the population was spread out with 14.6% under the age of 18, 5.5% from 18 to 24, 22.3% from 25 to 44, 34.6% from 45 to 64, and 23.1% who were 65 years of age or older. The median age was 50 years. For every 100 females, there were 95.7 males. For every 100 females age 18 and over, there were 96.8 males. The median income for a household in the CDP was $26,324, and the median income for a family was $29,375. Males had a median income of $26,250 versus $28,750 for females. The per capita income for the CDP was $25,469. About 14.4% of families and 37.8% of the population were below the poverty line, including 26.9% of those under age 18 and 67.9% of those age 65 or over. Smith Island has no airport and no bridges to the mainland; it can be accessed only by boat. Passenger-only ferries connect Smith Island at Ewell to Point Lookout , Maryland, and Reedville, Virginia, on the Western shore of the Chesapeake Bay (seasonal) and from Crisfield, Maryland, on its Eastern Shore (year-round). A daily passenger ferry also runs between Crisfield, Maryland, and the smaller island of Tylerton, Maryland. Few motor vehicles exist on the island's settlements. Main modes of transportation include golf carts as well as non-motorized transportation. Smith Island has its own region-specific traditional cuisine. 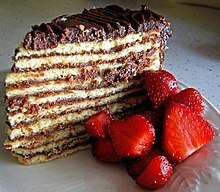 The most famous dish is Smith Island cake, similar to the Prinzregententorte, with 8 to 15 thin layers  filled with creme, frosting and/or crushed candy bars, and iced with a cooked chocolate icing. ^ Bureau, U.S. Census. "American FactFinder - Results". factfinder.census.gov. Archived from the original on 29 January 2017. Retrieved 25 April 2018. ^ "Smith Island, MD, Ancestry & Family History". Epodunk.com. Archived from the original on 2015-04-17. Retrieved 2015-04-16. ^ "Claws and effect". The Daily Telegraph. London. September 13, 2005. Archived from the original on November 22, 2016. ^ Scheller, William G. (March 12, 2000). "Island of Calm". The Washington Post. Archived from the original on March 5, 2016. Retrieved 2012-12-11. ^ smithislandcake.com Archived 2012-07-18 at the Wayback Machine The story behind our Smith Island Cakes. Accessed July 6, 2012. ^ "How Maryland's Official State Cake Got its Stripes". Saveur.com. Retrieved 12 February 2019. ^ smith island cake history Archived 2011-11-16 at the Wayback Machine from Original Smith Island Cake Company Website. Accessed October, 3o, 2011. Wikivoyage has a travel guide for Smith Island.